Compare prices from several car hire companies in Almeria and find the best price for car rental. Our prices always include unlimited mileage and insurance. It was probably the Phoenicians who founded Almeria when they ruled the area from ca. 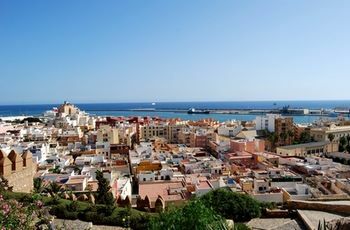 1100 f. NOK The city is located far south of Spain and borders Almeríabukta belonging to the Mediterranean. In 2009 the lay population of just under 200 000. In Almeria, there are many beautiful beaches, some of which are suitable for the typical beach life and offer more amenities, while others are more remote. Alcazaba is a fortress built in 700 AD and situated on a hill above the city, while the Gothic cathedral was built in the 1500s and located in the historical district. In addition, you can visit museums and caves, snorkel and go horse riding. Almeria International Airport is approx. 10 km outside the city.